Our Unique Design Far Exceeds the design of our competitors! Cut out 3D Molds on the DynaCNC Router Table and form the parts out of plastic. A complete system to make Plastic Parts! Our Machine is a REAL Industrial Quality Machine not a Hobby Toy! 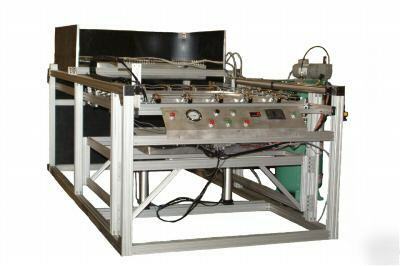 4' x 4' Automated TURN-KEY Machine! We Blow Away the competition with Better Quality and Price! OUR UNIQUE DESIGN FAR EXCEEDS COMPETITION FOR PRICE AND QUALITY! When it comes to Thermal Plastic Formers, Dynamic Plastic with the DP Former is second to none. Superior design and Function to other plastic forming equipment on the market today. We only use top grade materials, we machine our parts utilizing the latest CNC technology. We understand how important it is to own a machine that is of high quality, durability, and tolerance. Our plastic molding machines are fast and they use the highest quality manufacturing standards . This Plastic Forming system is all inclusive. All you have to add is your creativity and molds. Make your tooling molds with one of our DynaCNC 3D router Tables. Move to the latest technology: Anti-Vibration Structural Aluminum! FAST, RELIABLE, HIGH TOLERANCE, & REPETITIVE So if you are serious about a machine that is a CUT ahead of the competition, Here it is ! FAST REPETITIVE PRODUCTION FROM CONCEPT TO PART! Our Warm, Friendly, New 10,000 sq ft Manufacturing and Training Facility. Come visit us any time for a FREE Demo of our machine running! Please read about this great machine and our policies. * Footprint 80” wide" x 160" deep x 84” tall "
* FREE OSHA Emergency KILL SWITCH! * Pre-Programmed Computer Controlled PLC means Fully Automatic Operation of Cycles! We offer 90 days of free tech support on all of our machines. After 90 days if you feel you still need tech support we offer maintenance packages for one year at a time. We work hard to always deliver on time and as promised. We will need your zip code to determine the Freight cost. United States territories (Puerto Rico, Guam, etc), international military bases (FPO, etc. ), etc. are considered international freight. Our 7 Day Guarantee Against DOA (Dead On Arrival) does not guarantee compatibility. If something is listed AS-IS, there are absolutely no returns, refunds, or exchanges. The warranty period starts from the day the item is received. If you receive an item that we have guaranteed against DOA, and it is Dead On Arrival, please notify us immediately. We will then instruct you on how to return the item for an exchange or refund. There are no returns authorized other than DOA and Freight damage. We will not accept any returns without an RMA Number on the box, we will provide you with an RMA number when we discuss your return.